DAVAO City, Philippines – Sonny Wagdos and Judelyn Miranda claimed the top honors in the 21K event at the Davao leg of the 38th National MILO Marathon. 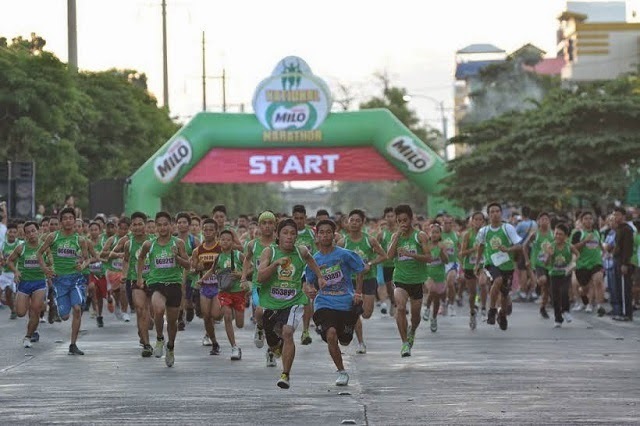 Over 10,000 runners joined the last qualifying leg of this year’s National MILO Marathon season. The Davao leg is the last qualifying race of this year’s National MILO Marathon season. Wagdos and Mirands each received a cash prize of P10,000 and a trophy, and will join the rest of the qualified elite runners in a heated finale at the National Finals in Manila on December 7, where the MILO Marathon King and Queen titles are up for grabs. The 2014 MILO Marathon King and Queen will also have the chance to run in the 2015 Tokyo Marathon, with all-expense paid trips to Japan sponsored by MILO. Easily navigating the route and using the good weather to his advantage, Wagos clinched first place with a time of 01:13:59, beating rivals Michale Jan Echalico (01:15:03) who followed in second, and Gilbert Maluyo (01:18:13) who placed third. On the distaff side, Miranda finished impressively with a time of 01:33:55, outpacing fellow runners Madelyn Carter (01:49:43), and Daisy Joy Dayondon (01:58:09), who placed second and third, respectively.